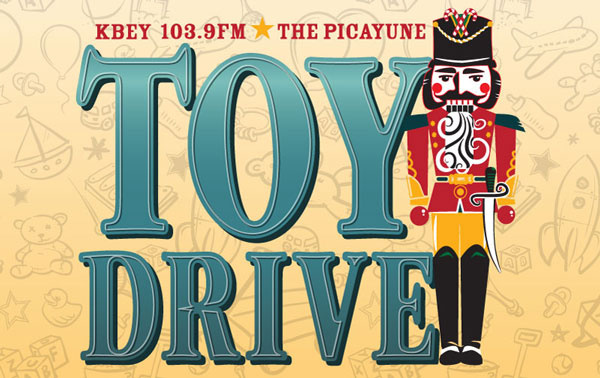 MARBLE FALLS — On the heels of a very successful food drive, KBEY 103.9 FM Radio Picayune and The Picayune are asking the community’s help for another big holiday event: the annual Christmas Toy Drive. On Dec. 9 from 6 a.m.-3 p.m., KBEY will have live remotes at the Best Little Pawn Shop, 806 Ninth St. in Marble Falls, and the Burnet Fire Department, located on U.S. 281 South by the municipal airport in Burnet. All the toys and donations collected will go to Highland Lakes Christmas is For Kids and Burnet County Santa’s Helpers. These organizations provide toys for children who otherwise might go without presents on Christmas morning. “These two organizations give hope to so many kids,” Weems added. “Without Highland Lakes Christmas is For Kids and Burnet County Santa’s Helpers, there’s a chance that a lot of children wouldn’t experience the joy they deserve around Christmas. “So we really want to encourage people to come out Dec. 9 and make a donation, whether it’s a new toy or money,” she said. During the toy drive, people can meet the “Wake Up Call” crew of Ed Chandler and Kay Baker. But there will be many other staff members from KBEY, The Picayune and 101 Fun Things To Do in the Highland Lakes stopping by as well throughout the day. And you might want to get your own Christmas list ready because Santa Claus is scheduled to make an appearance at the Best Little Pawn Shop during the toy drive. Go to ThePicayune.com or KBEYFM.com for more information. Go to GoFundMe.com/KBEYToyDrive to make a monetary donation online. And follow the Facebook pages of KBEY and The Picayune on Dec. 9 to see what’s going on during the drive itself.